A production by eight popular directors, starring over 30 K-wave stars with the topic: ”Super Star” on publicity posters, is finally revealed as melo-drama ”PIANISSIMO” which aroused heated discussions. The drama which is making the asian fans excited ”PIANISSIMO”which exudes ”Come & Goes in Silence” as a theme for all the different love stories. 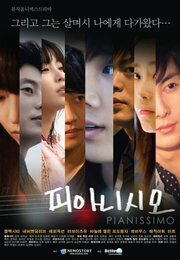 The drama with a total of 8 episodes (Black City, Never Ending Love, Happy Fiction, Love is You, Neddlestick down Grape Prince (slam10: sorry, don’t really how to translate this so I literally translate it), Mobius, Magic Hour and Meet), which are presented by the Hallayu stars and famous creative directors for the elements of the melo-drama. The drama includes SS501 members Kim Kyu Jong, Kim Hyung Jun, Park Jung Min, singer Moon Hee Jun, Son Ho Young, Nam Gyu-ri, Tei, Bae Seul Ki, Seo Ji Young, Ex-member of Baby V.OX Shim Eun Jin, Kim EZ, Kong Hyun Joo, Hong Jong Oh, Park Ki Ung, Lee Tae Sung, Hong Soo Hyun, Won Jun Choi etc represented by 30 over korean stars. As they have singers participating, acting in this drama for the 1st time, so you will get a different feeling when watching this drama. Recently, in a newcomer singer, Eiki, music mv ”Tearing”, they used the scenes from SS501 Kim Hyung Jun, Son Ho Young and Bae Seul Ki [Black City] which caused a topic. Mainly with K-wave Music Artist acting in this Melo-drama estimated to break television drama’s sterotypes at the same time inciting another K-wave. The programme is scheduled to meet fans early 2011.